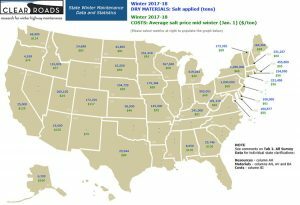 Clear Roads has published its fourth Annual Survey of State Winter Maintenance Data, which compiles data on winter resources, materials and costs from 35 states for the 2017-2018 winter season. The spreadsheet-based tool includes a United States map that displays many of these metrics. The tool includes four years of data, and displays averages and changes across winter seasons. See the project page.